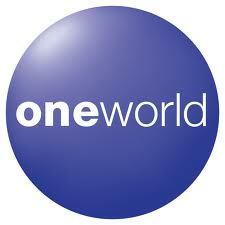 Shifting Airline Alliances: Which Is Best – Oneworld, SkyTeam or Star Alliance? Airline alliances are constantly changing – whether it’s mergers or new strategic partnerships, the landscape continues to evolve and in 2014 there will be some notable additions and exits from the major alliances. However, bigger isn’t always better, so deciding on the best alliance for you may take some careful analysis based on factors that impact your travel plans the most, like geographical coverage in the areas you fly, fare class earning between partners, and whether the alliance members actually release award availability on the routes you want to fly. Use airline alliances to your benefit and get more miles. I have broken it down into the three main airline alliances: Oneworld, SkyTeam and Star Alliance, and then also added in Alaska Airlines since it’s a major US frequent flyer program and has several great international airline partners, as well as both American and Delta here in the US. Remember, before you book tickets or fly, always check the policies for partner airlines and alliances to make sure you are aware of all mileage earning policies and opportunities. Also, since Alaska doesn’t officially have an alliance with their partners there is generally no elite status recognition. However, they do have special benefits with American and Delta and offer elite status earning on all partners. Here’s a quick table outlining the scope of each alliance including daily departures, destinations an annual passengers. Read on below to find out the specifics on each alliance and my thoughts on the miles to use in each. Just a quick note: These figures are based of prospective alliance membership by April 1, 2014, so they are subject to change based on route network consolidation. Award travel notes: Oneworld is arguably the best alliance for redeeming for international and domestic US three-cabin first class awards. Six carriers have solid international first class cabins: American, British Airways, Cathay Pacific, JAL, Malaysian and Qantas, and American is the only carrier in the US regularly operating three-cabin first class flights between New York and Los Angeles/San Francisco and Miami and Los Angeles. Note: Qantas first class award availability is generally very scarce, the others open up a decent amount if you’re flexible. There are a few great bonuses going on at the moment you might want to consider. The Citi AAdvantage Executive World Elite Mastercard comes with 100,000 American miles when you spend $10,000 in 3 months, Admirals Club (and now US Airways Club) lounge access, and you can earn 10,000 elite-qualifying miles when you spend $40,000 in a calendar year. The British Airways Visa Signature Card comes 4 Avios for every $1 spent on all purchases within your first year up to $30,000, and earns 3 Avios per $1 on BA purchases, 1 Avios per $1 on everything else, earns a 10% discount on BA purchases, as well as a Companion Ticket when you spend $30,000 in a calendar year. The Chase Ink Bold and Ink Plus both offer 50,000 Ultimate Rewards points (which can be transferred to BA) when you spend $5,000 in 3 months. 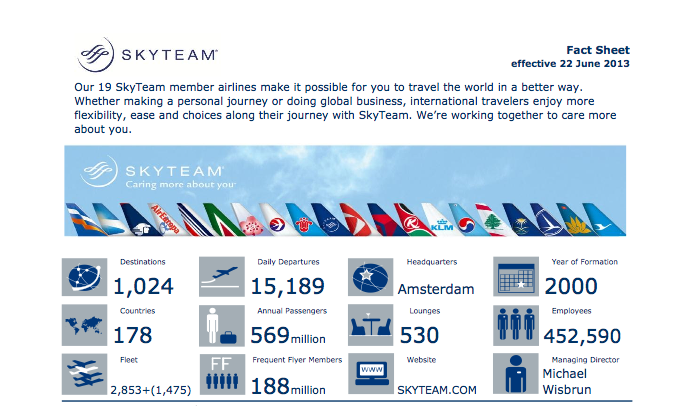 SkyTeam currently offers over 15,000 daily departures. Award travel notes: SkyTeam is possibly the least-friendly alliance, with numerous members blocking awards on partners (Delta blocking all international first class, Air France only allowing their elite members to redeem for first class and Korean with rolling blackout dates). Delta also recently hacked SkyTeam earning ratios and disqualifying all partner spend on non-Delta issued tickets from their Medallion Qualifying Mile program and only releases low-level award availability to partners, which can be very scarce- especially on international flights. Though public offers on the Delta Amex cards aren’t terribly high at the moment, you should check through the Card Match Tool to see if you are qualified for a higher sign-up bonus. Delta and Flying Blue (the frequent flyer program of Air France/KLM) are also 1:1 transfer partners of Amex Membership Rewards, so if you have a card like the Platinum Card from American Express or Premier Rewards Gold Card from American Express, you can transfer your points into either program. Korean Air is a 1:1 instant transfer partner of Chase Ultimate Rewards if you have the Sapphire Preferred, Ink Bold or Ink Plus cards. The largest of the airline alliances, there are some big changes coming to Star Alliance thanks to the exit of US Airways and TAM, and Air India’s prospective joining of the program. We’ve added Avianca Brazil’s flight statistics, but have taken out the flight stats for soon departing members US Airways and TAM since they will be leaving the alliance shortly. I also did not add Air India since their addition could easily be delayed (yet again) into 2015 and beyond. 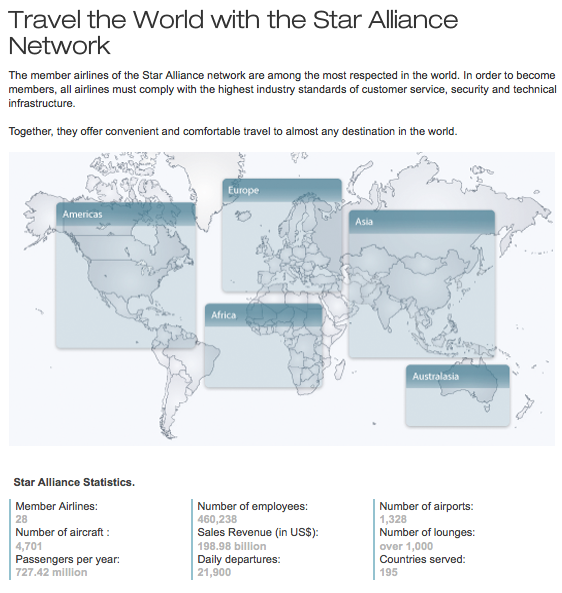 Award travel notes: While Star Alliance has a lot of members, there are also blocking issues between partners. 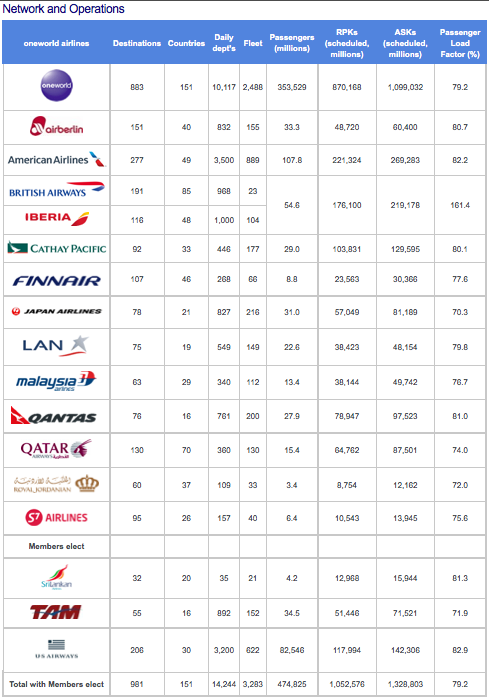 The following carriers are known to be very stingy with premium cabin partner award availability: Air New Zealand (especially between the US and New Zealand), Lufthansa (holding almost all first class space until the last minute) and Austrian/Singapore/Swiss releasing very few first and business class international awards. Additionally, United penalizes their frequent flyers by charging a premium to book partner flights in most circumstances, and Aeroplan has devalued their program several times int he past couple years and charge hefty fuel surcharges on many partners. You have your pick of Chase cards here. For just co-branded United miles, you can score an Explorer card with a 50,000-mile sign-up bonus in a Chase branch, while all three premium Chase Ultimate Rewards cards – the Sapphire Preferred, Ink Bold and Ink Plus – all transfer points to United miles at a 1:1 ratio instantaneously. Although not one of the three formal alliances, Alaska has several partners on which you can earn and redeem miles from its Alaska MileagePlan Program. Alaska does not currently provide stats on its global partner network, but by some measures it should be as extensive as the three formal alliances thanks to the fact that it partners with both American and Delta – the airlines that operate the most flights within their alliances – as well as other heavy hitters like British Airways, Air France/KLM and non-alliance airlines whose networks aren’t available to the alliances, like the ever-expanding Emirates, and Fiji Airways. Our research based on individual airline data indicates roughly 18,500 daily departures and 625 million passengers flown a year. Award travel notes: While Alaska did recently devalue its program, it paled in comparison to some others like Delta and United and did not impact partner travel at all. Perhaps the biggest downside to Alaska’s faux alliance is that you cannot mix partners on award tickets, but you can include Alaska and a partner on an award. Alaska has pretty good award availability o their own and combined with their numerous partners, like Emirates and their swanky first class, it is an option you shouldn’t overlook when deciding on a loyalty program.